I suppose that, because this release served as a soundtrack to Scorsese’s No Direction Home: Bob Dylan, it was appropriate that it include those moments which played such a big part in the film’s narrative. But as a standalone album, it felt like a bit of a cheat. That said, a couple of rare tracks stand out as exactly the sort of thing the Bootleg Series was meant for. ‘Dink’s Song’ and today’s SOTD, ‘I Was Young When I Left Home,’ were recorded in a friend’s Minneapolis apartment (along with 24 other tracks that haven’t been officially released). Here’s a glimpse of Dylan between the debut album that failed to set the world on fire and his second album which would do exactly that. 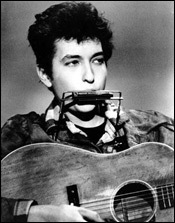 This entry was posted in dylan weekends and tagged Bob Dylan, bootleg, I Was Young When I Left Home, No Direction Home. well, with 24 more unreleased tracks from that session alone, I suppose the record company will be milking this bootleg series through Volume 20. Frankly, at this point the word “bootleg” needs to be dropped as this series seems to have lost that status many volumes ago.